Too expensive to update studio with digital equipment;Completely Integrated Solution—StudioBox is your best choice. StudioBox is designed by Dayang Technology Development Inc. It is a fully integrated product which includes functions such as signal switching with DVE, audio mixing, CG overlay, program playout, recording, and so on. Comparing with traditional studio system, StudioBox has more features, smaller size and simplified structure. If you have such challenges:No OB van for big events and important conferences;No equipment for course recording;Too complicated to set up a studio;Too expensive to update studio with digital equipment;Completely Integrated Solution—StudioBox is your best choice.StudioBox is designed by Dayang Technology Development Inc. It is a fully integrated product which includes functions such as signal switching with DVE, audio mixing, CG overlay, program playout, recording, and so on. 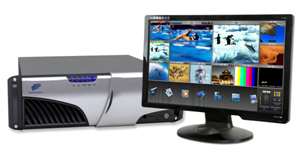 Comparing with traditional studio system, StudioBox has more features, smaller size and simplified structure. operator’s preferences with the control panel. Choosing character generator software installed to produce CG projects according to different requirements. 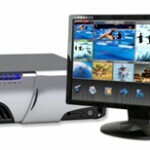 ■ Cost effective, a StudioBox includes the functions of switcher, mixer, DVR, clip store, CG and so on. ■ Simplify the work flow in studio with the functions of auto-triggered playlist and modifying playlists on the fly. ■ Reduce the work difficulty and meet diverse format demand with the function of multi-channel and multi-format ingesting. ■ Enriched program content with the function of virtual background. Real-time streaming media delivery technology for live webcast and VOD broadcast. ■ Air freight cabinet can be chosen to adapt diverse field conditions. ■ Easy to set up the studio system, one StudioBox can complete the functions of switcher, mixer, DVR, clip store, CG and so on. ■ Clips recorded in multi-channel are very convenient for the Post-editing. ■ Live webcast and VOD broadcast. ■ Enriches display effect by outputing video to the Stage Screen. ■ Supports VGA signal from computer, such as PowerPoint files. ■ Streaming media delivery technology for live webcast and VOD broadcast. ■ More clips for post-editing with multi-channel and multi-format ingest functions. ■ Enriched course content with the function of virtual background. ■ Lower down the cost of program production by accepting 1394 firewire transmission rather than expensive SDI signal. ■ Compact size and high mobility, can meet various scene environments according to different courses. ■ Economic Daily Securities Daily investment AG. ■ China Chongqing C.May animation production Co., Ltd.
■ Hangzhou Dingtian Advertising Production Co., Ltd.
■ Guangzhou Jinqidi Radio and Television Equipment Co., Ltd.
■ Beijing Youbang Electronic Technology Co., Ltd.
■ Chongqing ShengRui Technology Co., Ltd.
■ Chongqing shengsuan Technology Co., Ltd.
■ Hefei Foster Technology Co., Ltd.
■ Changsha Hangjia Television Equipment Co., Ltd.
■ Henan Xinyang Fortis Electronic Technology Co., Ltd.